The wolf is the leader of the Watchdogs of Farron covenant. It appears to be dead, but is not; it is only sleeping, in an emaciated state. Even so, it commands the watchdogs to defend the sanctity of sleeping warriors, the Abyss Watchers who became Lords of Cinder. Though it has a different shape and size, it is nevertheless a giant wolf, which in itself evokes this theory. The Undead Legion were created in Artorias's memory and sought to cleanse the abyss. Given those ties, the Old Wolf is at least an homage to Artorias's companion, Sif. 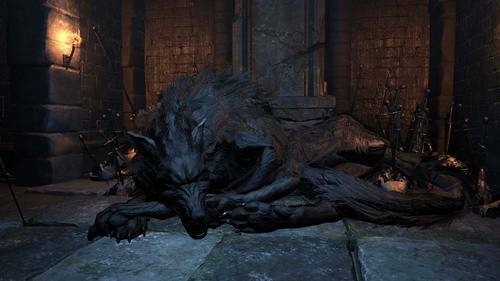 The Legion partook of the wolf's blood though (Undead Legion armor), so that may indicate an even stronger connection like a direct relationship between the wolves, or even a link through spirit or reincarnation. Ultimately, it may just be a thematic connection. Like Sif protected Artorias, so too does the Old Wolf protect the Undead Legion. After the Legion's Watchers became Lords of Cinder, the wolf blood dried up, and Farron was consumed by a festering wood. Within the wood, an emaciated old wolf commands watchdogs to defend the sanctity of sleeping warriors. Both the exiles were surely watchdogs themselves, for Farron has always been a land of itinerants. Possible relative or reincarnation of the Great Wolf Sif? Definitely! Not sure how this page got overlooked. Thanks for calling it out.